Are you searching for a great mattress store in Georgia to test out your next mattress purchase? Georgia is a bustling state and home to one of the most important cities in the South: Atlanta. No matter where you are, or what you do, you need to get a good night sleep. If you are in the market for a new mattress in Georgia, we have got you covered. We divided the state by regions and then examined some of the most populated areas to help us narrow down our search. 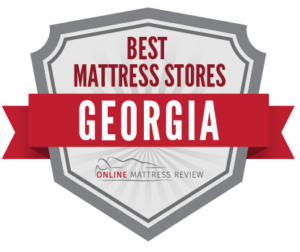 We then looked through the top-ranked shops in Georgia and selected a few mattress stores that stood out from the rest. Below you will find mattress shops that offer high quality mattresses, mattresses for every budget, and customer service teams that are friendly and knowledgeable. We understand that purchasing a mattress can be a bit daunting, so that is why we selected mattress stores that take the guesswork out of the experience. Below are the best mattress stores by region. Every wonder “Where can I find a mattress in Atlanta?” We are here to help. There are a number a great options for those looking to purchase a mattress in Atlanta. Natural Sleep Mattress & Organic Bedding (3129 Piedmont Rd. NE) is one of the top ranked mattress shops in the city and provides quality organic and toxin-free mattresses. The sales team is highly professional and can answer all of your questions about the benefits of green mattresses. Prices are affordable as well. Mattress Firm Ansley (1544 Piedmont Rd.) offers quality mattresses and great customer service. Mattress Firm does a great job providing consisten service and quality across the city of Atlanta with additional locations in North Druid (2562 Briarcliff Road) Vinings (2980 Cobb Parkway) and on near Atlanta in Decatur, GA (21112 N. Decatur Road.). If you are up near Sandy Springs you could try Factory Bed (4430 Tilly Mill Rd.). Factory Bed offers high quality customer service, name brand mattresses, and same day delivery. Are you looking for a mattress in Savannah? We have got you covered. Savannah has a number of mattress shops located across the city. We examined a few of the highest ranked mattress shops in Savannah and here’s what we think: Green Frog Sleep Center (7501 Abercorn St.). Green Frog Sleep Center is locally owned and operated and has been for 45 years. Green Frog carries a wide-range of mattresses, pillows and more. You will find a great staff, and a mattress that fits with most budgets. Sit and Sleep (30 W. Montgomery Cross Rd.) is a great option for any individual who is looking to get a great deal on a high quality mattress. You will find all of the most popular name brands at a low price. If you’re looking for an affordable mattress, try Sit and Sleep. Savannah Comfort (5525 Abercorn St.) offers quality and comfortable mattresses. If you are the type of person who experiences pain while sleeping, you will want to try the products at Savannah Comfort. It is all in the name. If you’re tired of tossing and turning in bed, head to Savannah Comfort. When looking for a mattress in Athens, try World of Futons. (2041 W Broad St.). World of Futons sells bed mattresses as well and is the perfect pick for any student who relocated to Athens. If you are on a tight budget and are looking for a quality mattress, try World of Futons. Mattress Firm Georgia Center (3690 Atlanta Hwy) is a great shop for quality product and quality customer service. Mattress Firm Georgia Center has a little something for everyone and offers convenient delivery solutions. There is an additional Mattress Firm at Epps Bridge (1850 Epps Bridge Pkwy). If you relocated to Athens or simply need to update your home, try Havertys Furniture (4120 Atlanta Hwy) where you’ll find a number of quality mattresses to match any budget and a whole showcase of furniture options as well. You are in luck if you’re wondering where to find a mattress in Macon. There are a number of quality mattress shops in town! Among the best-reviewed is Mattress Firm Macon (169 Gateway Dr.). Mattress Firm Macon carries all of the best quality mattresses and has a knowledgeable friendly staff as well. You will walk away knowing that you have found the right mattress to fit yourself and your budget. At Blair’s Too (468 Cherry St.) you will find a number of high quality and affordable mattresses. All furniture comes discounted. If you are shopping for a mattress on a budget, consider Blair’s Too. Mattress Barn (886 Pierce Ave.) is a great place to shop if you’re not sure which mattress works for you. There are a number of mattresses from which to choose and the welcoming staff will not push you to make a purchase, but rather guide you so that you can find a mattress that fits. This is a great mattress shop for first-time mattress buyers and veteran purchasers alike.